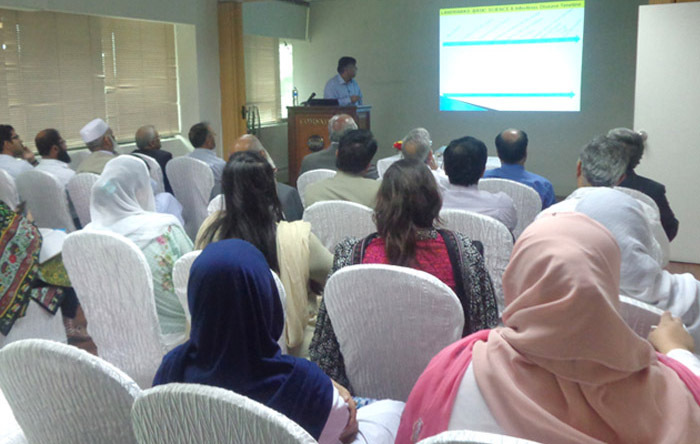 A lecture under COMSATS’ Science Diplomacy Programme, entitled ‘Biosurveillance: Science Needs for Microbial Forensics’ was held on April 19, 2016, at COMSATS Secretariat, Islamabad, Pakistan. 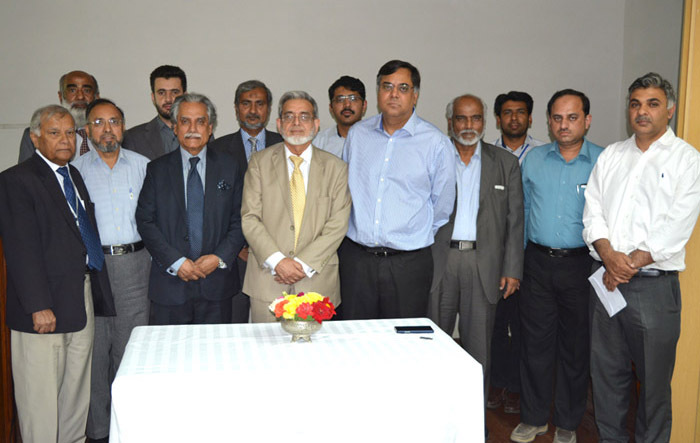 The lecture delivered by Dr. Habib Bokhari, Professor of Microbiology & Immunology at the Department of Biosciences, COMSATS Institute of Information Technology (CIIT), Islamabad, was attended by faculty members and students from Biosciences Department, CIIT; Faculty Development Academy (FDA), CIIT; Atta-ur-Rahman School of Applied Biosciences (ASAB), National University of Science and Technology (NUST); Islamic International Medical College (IIMC), Riphah University; Shaheed Zulfiqar Ali Bhutto Medical University; Abasyn University; as well as representatives from National Veterinary Lab, Islamabad; Pathology Department of Pakistan Institute of Medical Sciences (PIMS); and COMSATS Secretariat. 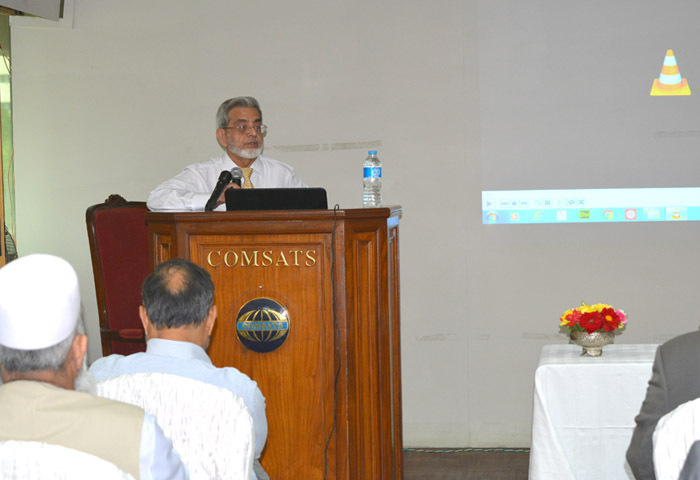 In his opening remarks, the Executive Director COMSATS, Dr. 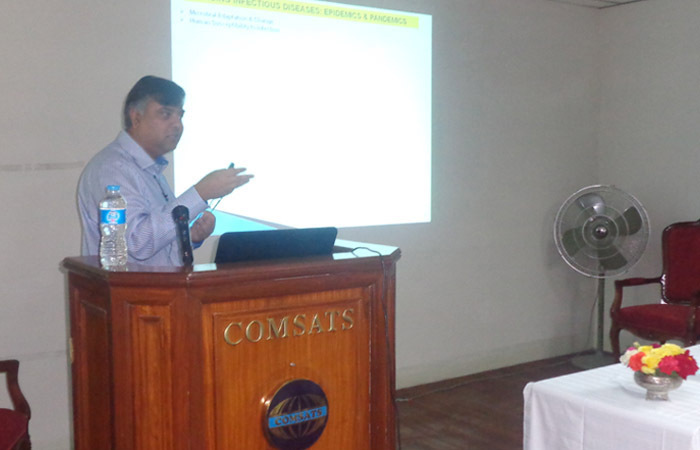 I. E. Qureshi, gave a brief introduction of COMSATS Science Diplomacy Programme. 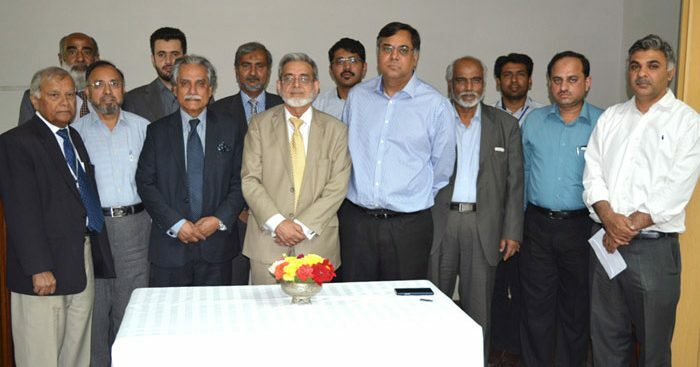 He informed that the lectures under the Series delivered by relevant COMSATS Science Ambassadors and experts would be an ongoing activity to create awareness among public and policy-makers on scientific issues of national and regional importance. Referring to the last lecture delivered by him as Science Ambassador Emeritus, he recalled the two issues for which campaigning is necessary: i) appointment of Science Advisor to the Government of Pakistan; and ii) launching of ‘Grand Challenges Pakistan’. He urged the audience to participate in the lobbying for both initiatives. Prof. Bokhari’s lecture was aimed at increasing awareness regarding microbia l forensics among the members of the larger scientific communities and elucidated the major issues that need to be addressed for global development of the science of microbial forensics. His presentation touched upon the fundamental understanding of microbial forensics, relationship between microbial forensics, public health and biosurveillance, unprecedented genomic diversity, factors responsible for emergence and re-emergence of infectious diseases, and history of biological warfare from 6th Century B.C to the present. He began his presentation with exploring the origin of genome, RNA as earliest form of life on Earth, and molecular evolution of prokaryotes. He noted that little is known about most of the microbial world, and strain level differentiation in the microbes has added more complexities in their identification. However, the ability to sequence the genomes of microbes has provided an enormous amount of new knowledge about microbial world. He gave an overview of the scientific discoveries and inventions in relation to the infectious diseases during the last few centuries that have changed the course of history. He briefed the participants about the Epidemiologic Triad of disease causation, consisting of host, pathogens and environment. He informed that the role of an epidemiologist is to break at least one of the sides of the triangle, disrupting the connection between the environment, the host, and the pathogen for stopping the propogation of disease. He shared a ‘Convergence Model’ to simplify the understanding of the complex dynamics of emergence of infectious disease and to help conceptualize how microbe–host interaction is influenced by various factors leading to the emergence of infection. These factors he noted include: genetic and biological factors; physical environmental factors; ecological factors; and social, political, and economic factors. He informed that a number of factors are at play behind emergence of infectious diseases and epidemics, which include: microbial adaptation and change; climate and weather; changing ecosystems; economic development and land use; international travel and commerce; lack of political will; poverty and social inequality; war and famine; and intent to harm. It was shown with instances of recent outbreaks around the globe that infectious diseases can take a huge economic toll on countries. A number of examples of such losses included that of SARS with economic tolls of US$ 40-50 billion worldwide; foot-and-mouth disease (in UK), US$ 18-25 billion; and Avian Flu, US$ 25-30 billion. It was opined that the epidemics of cross-boundary nature can also result in strained relations among nations, such as the outbreak of mad cow disease resulted in trade conflict between the USA and Canada in early 2000s. He also shared various examples of how hazardous nature of the infectious diseases was used to consciously inflict harm to masses, from the rudimentary knowledge of infectious diseases in ancient times to the use of sophisticated methods to spread biohazards as weapons during wars in modern times. He noted that due to low cost of production involved, bio-weapons/bio-terrorism would be major threats to public well-being in 21st century. He shared the list of bio-weapons reported to have been researched, developed, and weaponized in 1993 by USSR, and in US Bio-weapon Programme 1945-1969. Dr. Bokhari noted that the world community has acknowledged biohazards’ h uge potential of adversely affecting the masses and adopted conventions to restrict its use by means of Geneva Protocol 1925, Biological Weapon Convention 1972, and U.N. Security Council Resolution 1540 (2004). The Resolution, he noted, addresses all weapons of mass destruction and obliges UN Member States “to refrain from supporting by any means non-state actors from developing, acquiring, manufacturing, possessing, transporting, transferring or using nuclear, chemical or biological weapons and their delivery systems”. He considered it important to cater to relevant scientific needs for microbial forensics. The aim should be to prevent and reduce the likelihood of outbreaks—natural, accidental, or intentional; detect threats early to save lives; and respond rapidly and effectively using multi-sectoral, international coordination and communication. He highlighted the role of microbiologists in identifying and responding to the infectious diseases and other biological threats and considered coordination between microbiologists, veterinarians and public health officers crucial for preparedness for the epidemics/pandemics that may emerge in future. In the context of Pakistan, Dr. Bokhari noted that many of the infectious diseases in Pakistan are preventable with the help of some very basic measures. He noted that the country has one of the worst infant mortality rates, 2nd highest hepatitis prevalence; and 6th highest TB prevalence. He further informed that there are 100 million hospitalizations and more than 50,000 deaths per year due to naturally occurring food-borne illnesses in Pakistan. Other health risks of national and regional level include: polio re-emergence, respiratory infections, diarrhea, malaria, and dengue. He stressed the need for early detection, reporting and monitoring of such diseases for effective containment. Taking stock of the country’s preparedness to issues related to pandemics, epidemics, and bioterrorism, he noted the lack of necessary facilities, data and R&D activities in the country. He emphasized that establishing robust microbial forensic capabilities could enable the epidemiologists, public health policy makers, and law enforcement agencies to prevent, attribute and apprehend effectively. 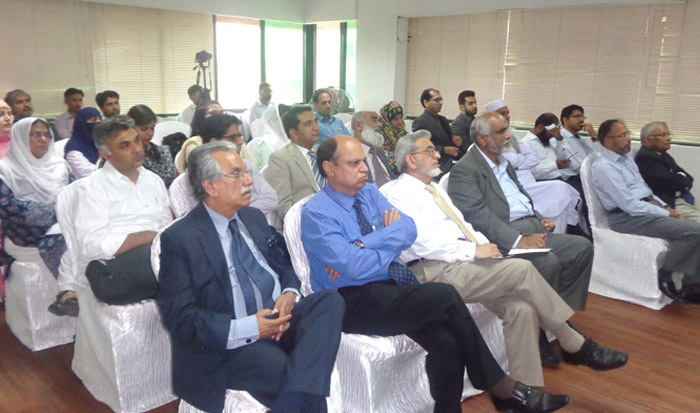 During the concluding Q&A session, key observations were made and issues were raised related to: potential of pathogens genome sequencing for pathogens source tracing, attribution, and forensics; developing metadata standards for operational biosurveillance; monitoring of poultry farming as possible source of epidemics; need to create a regulatory body to monitor concerns regarding biohazards; and necessary sensitization of the public health specialists and legislators.